Christmas is supposed to be the most wonderful time of the year, right? Except that, if we’re honest, it’s not always. If you’ve followed me for any length of time you already know this: I lost my love for Christmas about the time I lost my mom. And then when I lost Dad seven years later, well, let’s just say whatever wisps of joy I’d managed to salvage fizzled out too. Nothing was the same, and I didn’t feel like celebrating. Not a big surprise, but also not something I had much desire to change. 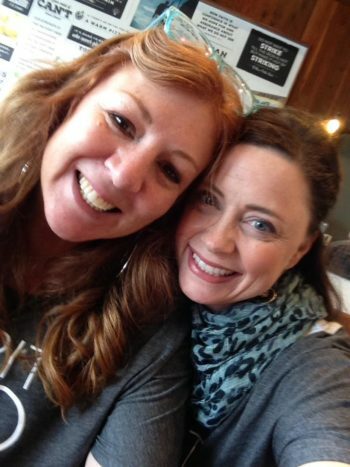 Along the way, a little over a year ago, I met this sweet, sunny, vivacious woman named Jodie at the Suzie Eller Retreat. Loved her right away, and enjoyed her even more the second year we attended together. She’s all about prayer and spreads love, genuinely, wherever she goes. Last year I discovered that she had hit upon a meaningful way to celebrate Christmas. It was all about meeting God under the tree in prayer, and she had written prayer prompts for each day of Advent—kindred spirits, right? When she asked me if I’d put together a prayer calendar to go with the release of her new Advent devotional, of course I said yes. And then the unthinkable happened: Jodie’s 22-year-old son died suddenly in a tragic incident. Every time I looked at my own son, I could barely hold it together. I saw pictures she posted online with her son, and the way they interacted in those photos reminded me so much of my son and me that it completely broke my heart. A group of us who were brought together by this retreat have been praying our hearts out for her and her family, feeling the loss so deeply that it can only be explained by God’s intercession. That’s one of the most beautiful gifts of praying for someone else—I can’t explain how it happens, but I’ve experienced firsthand how God allows us to experience some of the love HE has for that person. It changes your connection to them, and it expands your awareness of the loving character of God. It’s a beautiful thing—even when the prayers are initially prompted by sorrow. I haven’t written about what happened to Jodie anywhere because it felt too private. I don’t want to attempt to co-opt her tragedy for my own purposes, nor do I want to suggest that what I feel in any way compares with what she feels. But today I’m telling you about her for one important reason. Watching Jodie’s faith, seeing how deeply rooted she is in the truth of God’s goodness and love, even when it’s hard, even when it’s impossible, even when she is hurting and angry… well, it has changed me. I now have witnessed first-hand what it means to have a sustaining, life-giving faith. I’m watching her feel her way forward, spending time with God in prayer, feeling compassion for others affected by this horrific accident, always looking for God in the midst of the sorrow and pointing people towards God without fail. Jodie inspires me tremendously—because she reminds me that the joy God offers is not dependent on circumstances. But this is not something new. She’s having to live out her faith in a way she never wanted to, but it didn’t just start right here. Rather, the roots of her faith go deep, and they were planted in joy. 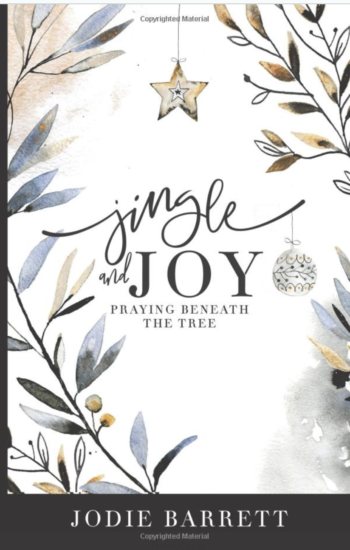 Jodie’s brand new book, Jingle and Joy, just came out last week and popped straight to #1 in Amazon’s prayer category. I had the privilege of reading it before it released, and what struck me the most was the joy filling the pages. It’s full of deep insights in short devotions, just right for busy women during the busiest time of the year. And to make it even better, it’s all about finding that joy through time spent in prayer. Prayer is where we can find peace, and it’s where we grow closer to God. I look back now at my stubborn refusal to enjoy Christmas because it wasn’t on my own terms, and I see how immature that response is. We all have situations and people and losses and sorrow that interfere with our ability to celebrate sometimes. But I think this book is a great first step towards finding our way back. 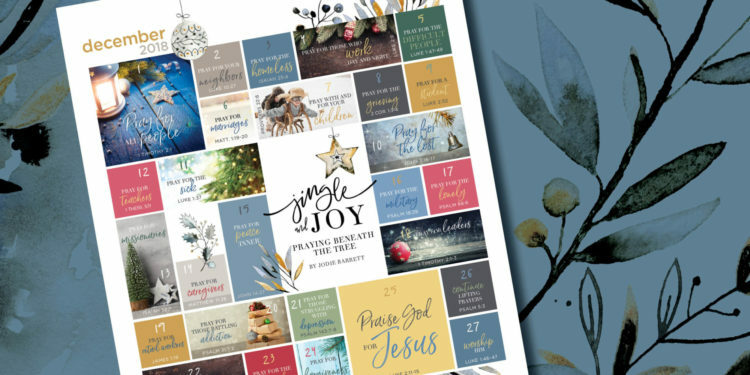 So today I am honored to be able to offer you my free December prayer calendar with Jodie’s prayer prompts. To download it, click here. And since this is a season of giving, I’ll also be giving away a free copy of her book. To enter, leave a comment after this post (or on my post about this book on Facebook) sharing what your biggest struggle is with keeping your thoughts on the meaning of the season. I’ll pray through your responses, because prayer can change things we can’t, and because this time of year can be especially hard. I hope that you will consider grabbing a copy for yourself, and one for a friend. As another friend said, this book is a great addition to your nightstand this season. More than that, though, it’s about what it will do for your heart… what God longs to do, if you’ll just slow down and sit with Him. He’ll show us, individually, personally, the abundant gift we have to celebrate at Christmastime—and always. One quick note: you’ll see that this calendar looks different than my usual ones. For one thing, it’s vertical, and for the other, it was designed as a perpetual calendar, which is meant to be used year after year, and therefore does not have the prompts in a calendar grid under headings for each day of the week. I was going to create a version of this in my usual format for use by my subscribers, but honestly, I liked the one I did for her better. So if you’re someone who collects these and is aggravated by the inconsistency, please forgive me. It’s a one-time thing, I promise :-). Those weeks before my dad died were a blur, a photo montage, like quick takes from a movie. Hourly care schedules, changing almost daily. Trading nights with my sister, sleeping (but not sleeping) on the futon in his room, alert to every movement my dad made in his sleep. Jumping up, once I finally started to doze, to comfort Dad that his dreams/hallucinations weren’t real. Sitting in the dark, holding his hand, trying not to let him see the tears. The constant mental countdown to his next dose of oxycodone. The other mental countdown until morning, keeping track of how many hours I was unable to sleep. Meeting the hospice people, juggling the changes to his meds, listening to the oxygen machine drone on, taking his blood pressure and dutifully recording it in our book. The mornings when I’d go over to have coffee and Dad would drift in and out of sleep, the Today Show playing way too loudly because he wasn’t wearing his hearing aids. His sweet personality showing in the way he’d compliment everyone who came in to care for him—even if it made him wince in pain. He even praised the oncologist, the one who told him he didn’t have much time, for his good bedside manner and his clarity in explaining things. It was a time of constant motion during which my absolute physical exhaustion seemed to be at a level appropriate for the emotional turmoil I felt. My mom died six years earlier, also from cancer, and I just didn’t think I had it in me to get through losing my dad, too. When Mom went, it felt like divine cruelty. But when Dad died, it was different. Every situation—every loss—is different, but I knew something this time that I hadn’t known before. I understood how big the pain would be, how it overtakes everything else, how it cuts you to the very core and cannot be resisted. So this time I didn’t try to fight it. I absorbed it. I didn’t brace myself against its impact, but instead, let it wash over me. Through me. Fill me. I knew it would become a part of who I am forevermore so I didn’t bother to resist. I’d learned that grief is not something to “get over.” It is not something that goes away. It seeps in, changing the color and tone and very foundation of who I am, forevermore. Yes, I’m changed by the loss of my dad, and that loss will come to partially define me. But more so, I’m defined by being his child in the first place. When Dad passed, it felt like compassion, not cruelty. I felt a kind of exhilaration that I never expected, a joy, and the “peace that surpasses all understanding” (Philippians 4:7). Not having Dad here is hard—and yes, that’s an understatement. But sometimes it doesn’t feel as much like a loss as an addition to who I am. I wasn’t losing something, but adding something. I get to carry forward the traits of my dad that he planted in my genetic code. I get to live in a world that knew him, that respected and honored him, and share him with others who miss him too. I get to pick up where he let off. I get to take him forward with me as I move forward, which I inevitably will do—because there really isn’t a choice. Because I’ve discovered that even in my grief, even in the face of my pain, there is joy to be found. Contentment. The soothing balm of faith. Glimpses of beauty even in times of sadness. Joy isn’t only found in the sunshiny moments, in the happiness and cheerfulness of things going right. Even more beautiful is that which comes in the face of mourning, in the shadows of sorrow. Because when we can find joy in those ordinary and less-than-ideal moments, there is no doubt where it comes from. When we can see joy then, we know without a shadow of doubt that God is present. And that is enough to make my heart rejoice. Dear Lord, You are a compassionate God and You mourn when we mourn. But You also promise to turn our mourning into gladness. To give us comfort and joy to replace our sorrow. To be with us in every moment. Your very presence brings with it unexplainable, unspeakable joy. We praise You for this and ask You to be with those who are learning to live with a loss. Let them find beauty—let them see You—even in their pain. Because Your compassion is boundless and Your love is without end. Amen. Join me over at Real Women Ministries for study questions and to continue this discussion—and while you’re there, check out this whole series. Lots of women being real… lots of inspiration to be found. 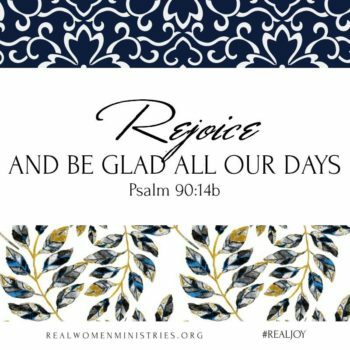 I’m honored to be part of a devotional series at Real Women Ministries about finding joy in everyday life. Sign up to receive the complete series (which will last about a week) here. I was flattered when I was invited to participate in this devotional series as one of the writers. Honestly, I wasn’t feeling all that joyful, but that was OK. I figured I’d get past it. I kept moving the task forward on my to-do list, waiting for inspiration. Finally, it came—in the sense that my devo was due in two days and I needed to get off my rear end and write it. So I wrote, and what I wrote was true. 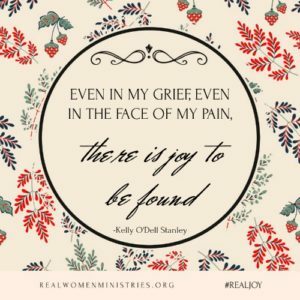 I’ve been in a rough season, a time of grief and stress, and “joyful” is not how I would describe it, but as I wrote, God reminded me of the reasons I have to feel joy. He reminded me who He is, and that joy is different than happiness. Happiness is fleeting, but joy comes from a much deeper place. A place of abiding in God. Of choosing to walk alongside Him even if the place you’re walking through isn’t all that pleasant. When I hit “send,” I felt much lighter. More joyful. And then one of the other writers posted in our private Facebook group about how she was struggling. She confessed that she didn’t feel joy right now and she was dreading writing about it. Several others chimed in immediately, full of understanding—because they’re struggling, too. That’s when I decided to write another post – this one. Because if we’re all struggling—women whose ministry consists of encouraging other women and sharing God’s truths, women who were approached to share their insights about joy—then you probably are, too. Maybe you need to know you’re not alone. This isn’t a failing on your part. Your feelings don’t indicate a lack of faith or an absence of God. The other thing is this: even when we weren’t feeling it initially, if some of us have been able to turn that around to find joy, you can too. Because I think living joyfully is a choice. It’s about focusing on what we know, not what we feel. When we CHOOSE joy, we’re choosing to have faith. We’re choosing to trust. We’re turning away from our own fickle emotions and declaring that the bad stuff doesn’t define us. Evil, sadness, worry, misery, fear, darkness—those traps of the enemy do. not. win. Jesus does. Choosing joy is declaring that we’re not staying stuck in the muck and the mire but instead we’re believing God’s joy will dry the mud and pull us out of the pit we’ve fallen into. So if you’re looking at this series and feeling like you do not belong here, do not despair. Joy IS there to be found. It can be seen when we abide in God. When we go to Him because of who He is, not because of what He can do for us. Let’s pull back from our problems and pray. God, my hope is in You. You have saved me. You love me. You declared that I am worth everything You did for me. You want me to be with You. You take joy in me. And I will not let that go unnoticed. I will not waste what You have given to me. I will live with joy. I will let You prevail. Because You are good and holy and kind and merciful. You are love, and You are light, and You are my hope and salvation. You are the very essence of joy, and I will allow myself to let Your joy shape my life. Amen. 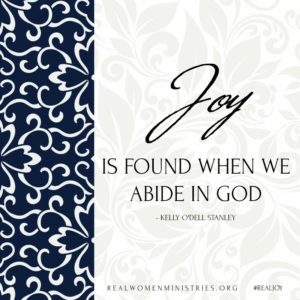 Head on over to my post at Real Women Ministries for some study questions and to take part in our conversation about joy. And know that, whether you’re feeling it now or not, you are not alone. Good morning! I have a new post at Internet Café today. Please join me there to read the rest of it.